Black caviar, which is extracted from fish of the sturgeon family, today get has become quite difficult, and prices just skyrocketed. Meanwhile, gourmets and ordinary Soviet citizens still remember the intense and unique taste of this delicacy, which is disclosed in full, if you eat this treat all the rules and to combine it with suitable foods. Black caviar has a very special delicate salty taste that almost needs no "design" other products. All that is required in its consumption – any alcoholic beverage. In traditional Russian cuisine this delicacy was always a bit of vodka. 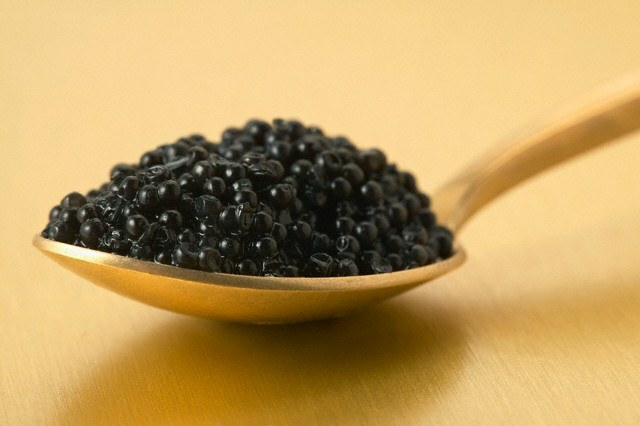 However, in European countries, caviar is usually used solely with sparkling Brut from the champagne region - it is believed that only this wine can harmoniously set off the taste of this seafood. And real gourmets prefer to eat caviar spoons. Not only Cutlery, and small silver. According to their statement just such a metal does not affect the quality of the taste of this delicacy. Very black caviar in this case, placed in small glass, ceramic or silver ikornitsy, which is placed in a dish, studded with crushed ice. The latter supports the optimal temperature of the Goodies and contributes to the preservation of its unique taste. Another option for foodies – eating black caviar with raw oysters. In this case, the last open served together with slices of fresh lemon and a separate filled with black caviar a bowl. Before you eat the contents of the oysters, it must be sprinkled with lemon juice and put a spoon of black caviar. This dish is also served with Brut. In Russia black caviar was eaten with pancakes – this appetizer could not be better suited to vodka. Later, this delicacy began to spread on bread with butter. Latest product, by the way, is able to protect the stomach from poisoning if the eggs were not very good quality. Also caviar is eaten with crackers, served in tarts or profiteroles – small size fresh pastries from choux pastry. In this case, the treat instead of butter often make a special delicate cream that consists of soft cheese and whipping cream. In addition, the eggs can also be eaten with olives and herbs. The ROE of sturgeon, especially Beluga and sturgeon, valued not only for its taste but also for the presence of a huge number of nutrients. This is a real storehouse of minerals: iodine, zinc, iron, manganese, silicon, sodium, potassium, phosphorus and calcium. It is rich in vitamins a, D, b group and e, As containing in it has high protein value and easily digested. This is why this product is useful for strengthening the immune system, particularly after a long illness. Calorie breakdown black caviar is 236 kcal per 100 g of product, granular and slightly below – 200 kcal.